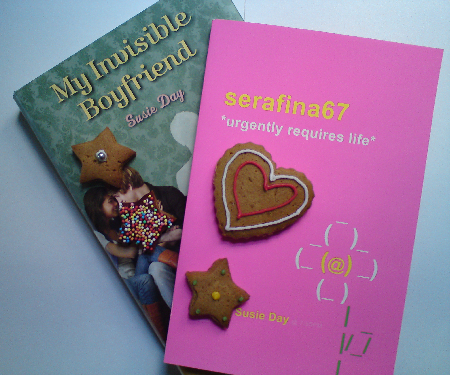 To mark the last of My Invisible Boyfriend‘s celebratory 7 Days of Stuff, what better than a giveaway? Want to get your hands on this little lot? In My Invisible Boyfriend, Heidi creates an imaginary BF inspired by a gingerbread man. To win, create your own invisible friend (no gender required, and you’re very welcome to keep things platonic), and send me a picture. It can be a real gingerbread cookie, or a drawing of one. Check out the last Fabulous Bake-A-Boy Challenge gallery for inspiration, and links to a deeply yummy gingerbread recipe. Send me your invisible friends! Good luck! And if you missed it, don’t forget to check out the rest of the 7 Days of Stuff! 1. Please read these competition rules carefully. If you enter this competition, we will assume that you have read these competition rules and agree to them. 2. This competition is open to residents of any territory. Void where prohibited. 5. The instructions for entry contained in the adverts publicizing this competition form part of the competition rules. 6. Any personal information (entrant’s real full name, age, address, telephone number and/or email address will be used solely in connection with this competition and will not be disclosed to any third party, except for the purpose of fulfilling the prize where applicable. Any personal information held by the Promoter in respect of the competition will be held on record for a short period for the purpose of ensuring fulfillment of the competition. 7. Entrants give permission to the Promoter to reproduce any images submitted by entrants in connection with this competition on this website. 8. The winner will be the entrant whose entry is selected by the judges. 9. The closing date for the competition is May 7th 2010, and the winner will be decided on May 8th 2010. 10. If you win the competition, we will notify you by email on May 10th 2010. The judges’ decision will be final, and no correspondence will be entered into. 11. Prizes should be received within twenty one (21) days of the closing date. 12. In the event that the Promoter cannot for any reason contact the winner by 25th May 2010 the promoter reserves the right to select another winner. 13. No part of the prize is exchangeable for cash or any other prize, although if the advertised prize is not available, we reserve the right to offer an alternative prize of equal or greater value. The prize is subject to the additional terms and conditions of the manufacter and/or supplier. 14. Incorrectly completed and/or copyright-infringing entries will be disqualified. 15. These competition Terms and Conditions shall be governed by and constructed in accordance with the laws of England and Wales and the courts of England shall have exclusive jurisdiction in relation to any disputes arising there from. wow Susie, you have T&Cs!